This will be the last “development update” post for a while, as I’ll be off on holiday for a month. The RCG Development Tracker has just been updated and I’ll get back onto things in November. Oh, and one of the updates is that I’ve added in the Northern Busway and (proposed) AMETI busway. It’s been a pretty big month for office development, with two major new office buildings announced in August. Let’s take a look at the offices popping up around Auckland. 125 Queen Street has almost finished its refurbishment, with 15,000 sqm of space soon to be available. The buildings at 2-4 Grantham Street, known as “151 Victoria Street West”, “NZME Central” and various other names, are now complete. 17,600 square metres (sqm) of office space, developed by Mansons TCLM. One Mill Lane fell by the wayside, and is up for sale by its owners, Mansons TCLM. It could potentially become apartments, but it all depends on what the new buyer wants to do with it. Commercial Bay, aka the Downtown Shopping Centre site, is underway, and will add 35,000 sqm of office space in early 2019. The developer is Precinct Properties. Precinct is also developing 48,000 sqm of office space across five buildings in Wynyard quarter, with the first stage of 12,000 sqm underway. Mansons TCLM are developing 10 Sale Street, with 10,000 sqm of space. Goodman are developing 40,000 sqm across several buildings at the southern end of Wynyard Quarter – Fonterra and Bayleys, both finished, and Datacom, due for completion next year. All up, that’s a whopping 166,000 sqm completed, underway or planned for the next few years, enough space to accommodate at least 13,000 workers (based on Colliers metrics). Another factor in the city centre, and not as prevalent elsewhere, is older office buildings being converted to other uses – apartments, accommodation or education. As such, the ‘total’ amount of office space won’t increase as much as the figures above suggest. In August, Mansons TCLM launched a new project in Newmarket, currently known as “33 Broadway” although it will most likely be given another name when it’s finished. A lot goes on behind the scenes – by the time the building was announced in the Herald, Mansons were just about ready to begin construction. Mercury Energy was already signed up for two-thirds of the space, and the shops in the existing buildings were getting ready to close. Demolition is now underway. The Herald article mentioned that there was 4,600 sqm of space left to lease, which makes the building sound a bit smaller than it is – it’s close to 12,000 sqm all up. That makes it the second largest office building in Newmarket, if I’m not mistaken (Watercare House, also built by Mansons TCLM a few years ago, is a little bigger). At Sylvia Park, a new office building is just getting underway, with new headquarters for IAG. This is significant in that it’s the first office building at Sylvia Park – in fact, just about the first office building to be built within a ‘shopping centre’ in NZ. This is quite common overseas, and Sylvia Park in particular is poised to become more of a mixed-use hub. The new building is around 12,000 sqm, so a pretty sizeable development. In the ‘St Georges Bay Rd’ part of Parnell, another major building is underway: 10,400 sqm, and again it’s by Mansons TCLM (as you will have seen, this name comes up a lot in office development!). Smales Farm is also significant – new headquarters for Vodafone coming in at around 10,000 sqm, and of course the office park still has plenty of room to grow. There’s also a bit happening at Albany, Highbrook and Auckland Airport, and in the “Southern Corridor” (Great South Rd in the Ellerslie/ Penrose area). 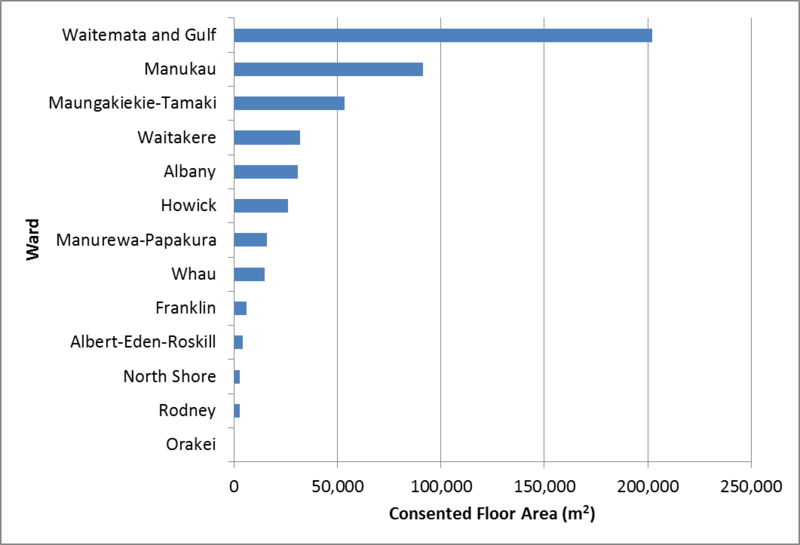 Looking at building consents across the various Auckland wards, 42% of office floor space is being created in the Waitemata & Gulf ward (which includes the city centre). That share rises to 51% when looking at the figures by dollar value. One key shift in recent years has been buildings with large floor plates (i.e. large sites with mid-rise buildings, rather than narrow towers). Many of the new buildings also have Green Star ratings. In terms of location, most new offices are going up where there’s good ‘rapid transit’ access – the city centre obviously has this in spades, but Newmarket, Smales Farm and even Ellerslie all have their own high-quality public transport links. This will only become more important in the future: it’s about accessibility. I think it’s really exciting that an office building is being built at Sylvia Park – I’ve always wished for greater integration between retail, living, and office jobs at our Shopping Centres in NZ. There’s no reason they can’t have apartments, hotels, and offices as part of the wider development; creating integrated hubs of life. Agree.. very good. Sylvia Park should resemble Chatswood in time. Which makes it important that local green spaces (particulalrly Mutukaroa / Hamlins Hill) are protected and enhanced. They’ll need to fix the motorway. It needs to be 3 lanes at Sylvia Park. why? It widening it there wont provide any congestion benefits. How on the earth would that benefit offices located at Sylvia Park!? Residential is the missing link and it didn’t seem to be part of their long terms plans for development. As part of the new tower they have a planned “Town Square” redevelopment, which would seem odd – to have a town with no people living there. Will be interesting to see the jump in rail patronage at SP once the commercial tower is finished and full. Might help the push for a station more befitting the location. Sylvia Park’s owners only do office and retail, although they’ve said in the past that they’d be open to the idea of letting someone else develop a residential component on the site. I could imagine a hotel as being more likely, though. I thought the ugly roof on 125 Queen sSt was supposed to be getting fixed. Now it doesn’t seem like it. That building needs to be nuked. The most Bell-end like building ever. Is One Mill Lane the old NZ Herald site? It’s about accessibility and Wynyard Quarter. A slow moving disaster. One bus every half hour and that takes you to Ponsonby or Onehunga! A 15 min walk to the Northern buses if you include getting across Fanshawe St. Other than that nothing. No RTN, nowhere near enough parking and a crap walk to town. Yet people are signing leases. It’s almost as if the people signing leases value a pleasant space over the ability to drive there. How pleasant do you think it will be with 1000s more people living down there and 100,000s of sqm of office space with people working there and no PT? A view only goes so far. It will be our mini version of Docklands where heaps of buildings get built that you cant get to, so then the public get to pay through the nose to provide accessibility using narrow routes compromised by buildings. Seriously, its an easy walk to those bus options, there is a future rail going through there and once more buildings are up I am sure there will be better bus links. But that is the issue. We could have had PT built in as the area developed. Instead we just go the Docklands way of ‘do wtf you want’ and ignore all transport modes. In the Docklands case they then had to build both the Limehouse link- the most expensive section of road in Europe and the Jubilee line Extension. Both of which were more expensive as they had to be squeezed in ex-post. If you get to have an office on the waterfront you get to enjoy the charm, but a lot of what will go in wont get the view but they will get to share the whole hassle and pain. If I were signing a lease for a large office I would opt for somewhere near Britomart, Aotea station or K-Road station. That is what accessibility means. mfwic – Limehouse Link was primarily so expensive as it had to be built underwater… which is not necessarily the case here. And re the Jubilee Line – I worked on the project, and it was expensive because it crossed the river 4 times, but on the south side of the Thames, it ran mainly under existing railway tracks – and on the north side, it steered pretty much exclusively through brownfield sites. In hindsight, the public got it at a bargain price of 2 billion quid, mainly because the entire industry was on its knees and desperate for work. It’d cost a lot more now: see CrossRail. Still – what you appear to be saying is that Wynyard quarter should have PT running through it (perhaps at the centre, or at the north edge?) rather than along the southern boundary? Isn’t Fanshaw St close enough to walk to? Its only about a 5 minute walk from Silo Park, is it not? Far more pleasant then it even is now, probably the most pleasant neighbourhood in the entire city. Seriously, minor improvements to Fanshawe Halsey and Wellesley Streets which are all necessary with or without any development at Wynyard Quarter are all that are necessary for at least 2 decades in Wynyard. Guy M the point is that had the transport linkages to Docklands been planned to match the land use, it might have cost the 400million pounds estimated. Instead the Jubilee line Extn cost 3.5billion pounds. A sum of money sufficient to stop or delay both Crossrail and the Chelsea- Hackney line. Remember opportunity cost? The Docklands Light Railway was planned to service a residential development, Thatcher upzoned the whole thing without any transport planning resulting in buildings with no access. Inevitably the tax payer got to pay for both the Limehouse Link and JLE (but I am gladdened to hear you got something out of it all). Obviously Wynyard is considerably smaller but the original planning included talk of a PT light rail connection to Britomart, sadly that changed into a tourist tram loop instead. The reasons people are going there is because the land is so much cheaper (in part because the access is crap) and they can build large floor plates. But like Docklands it will end with public money being spent to fix access after the easy options have already been removed by development. Surely issues with access to the Northern Busway could be addressed by improving pedestrian access across Fanshawe St? It *will* require traffic engineers to pay attention to people on foot as opposed to in cars, which might be painful and difficult for them, but it is possible. * This destroyer of walkability, if trying to come via Wyndham St.
Victoria St is also currently pretty meh, which is a shame because there are some pretty good bars popping up on Nelson St that I don’t go to as often as I’d like. I would like to say those are like that because they were built at a time that few people walked there. Sadly it isn’t true. The whole Hobson St bridge and extension of the Hobson Nelson one way pair happened when people already knew better. I think it was around 1989, but was a last gasp of the 70’s. My own contribution to the omni-shambles is the little footbridge across Sturdee st from the carpark to try and get people over that crap. So Albany is seeing barely more office development than Howick? And by the time Manukau is taking off it’s basically central. Edge cities = bad ideas. Still doing a lot better than “North Shore”. Isn’t that where Takapuna is? That’s probably the most connected place on the Shore. I think that’s because, with the exception of Albany, the North shore is “built out”. With current zoning laws, combined with the power we give a small number of NIMBYs, it’s quite hard to build new office area in Takapuna or around the North Shore. Hopefully the unitary plan will help fix this. Albany has had parking rules that were a disincentive to building offices. They have had something similar to the PAUP from the beginning. The net result was if you were building an office you went elsewhere where you could get parking. Now constraint applies everywhere maybe Albany wont be last on the list anymore. As for Takapuna how on earth would anyone think it is ‘connected’? It has no access to the motorway, no access to the busway and poor pedestrian linkages. Takapuna is a perennial struggler. Its future is as a nice place to live in a flat. +1 takapuna is a get place to live but until the train goes in its a poor place to build more office space. We need to fix the ones we have rather than building a new one. Parnell station in the wrong place in order to create a heritage precinct that won’t now eventuate – Mike Lee needs to be called on that. Its not all bad though. the retirement and student villages nearby should generate patronage. And it will probably be a pretty station (if that matters) aligned with the Domain. Some thought needs to go into how to make an easy link to the Parnell business north, too.